Background: Education curriculum theory espouses the combining of theories and an appreciation of the process of theorising. These theories have been grouped under prescriptive, descriptive (including deliberative) and critical-exploratory sub-headings . This paper describes the use of theories from each of these sub-headings in the development and analysis of an innovative work-place based learning programme for senior medical students. 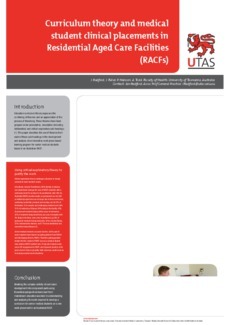 Summary of work: Since 2011, final-year , University of Tasmanian medical students have undertaken a one- week placement in a Residential Aged Care Facility (RACF).Curriculum theory has been used to inform the evolution of the programme and to analyse research findings of the first thirty months of the programme. Summary of results: A prescriptive theoretical approach to the placement’s curriculum has resulted in a proposal for use of ten Cate et al’s concepts of entrustable professional attributes to describe the programme. A deliberative theoretical approach has led to iterative improvement in the programme as academics and RACF organisations deliver the programme. This will be described. A critical-exploratory theoretical approach has provided analysis of student engagement with the programme. These findings will be outlined. Discussion: This paper argues for, and illustrates the benefit of, using a combination of curriculum theoretical approaches to gain insight into curriculum work. Conclusions: The use of combined curriculum theoretical approaches offers useful tools for conceptualising, developing, and analysing medical education curriculum work. Take-home messages: Curriculum theories are useful in curriculum work. 1. Marsh C: Key Concepts for Understanding Curriculum. 4th edition. Oxon: Routledge; 2009. 2. Ten Cate O: Entrustability of professional activities and competency-based training.